This is the little ornament I received from Lisa. I have a small mermaid collection going already so this fits in perfectly. 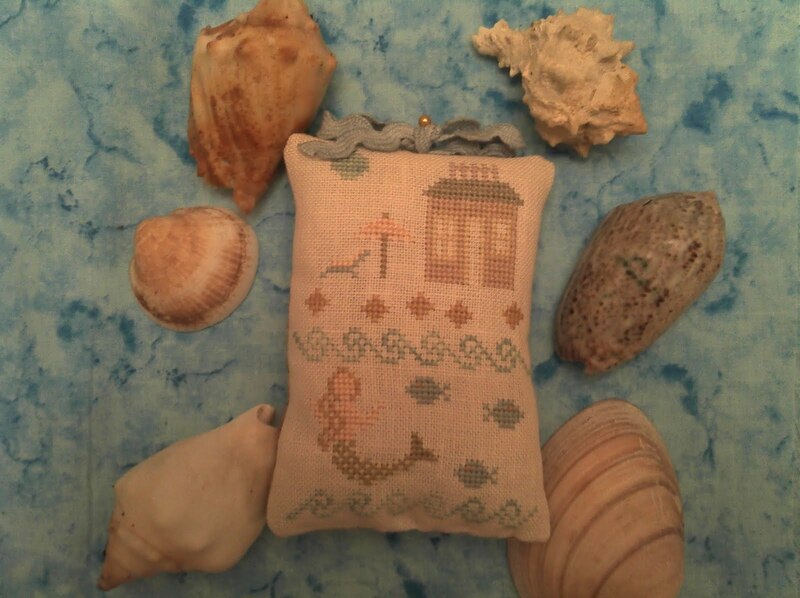 The back is a sparkly sand colored fabric that matches the stitching perfectly. 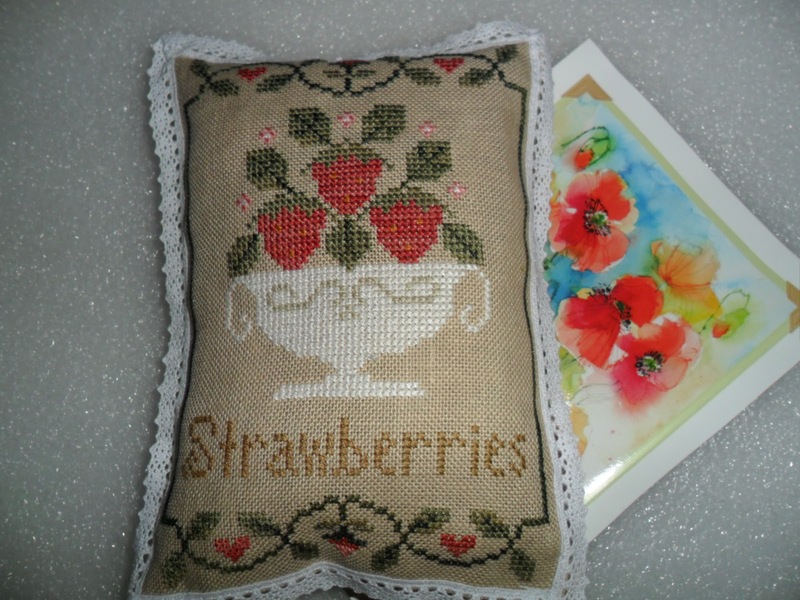 Below is what I stitched for Laura, yes my mother did have to help me sew this trim on. Doing these exchanges has really help me expand my finishing skills. Seeing everyone else's beautiful finishes always makes me want to improve my own skills. 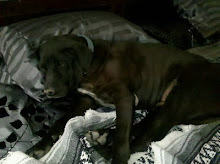 And this is from the Hooked on Exchanging group. This is what I sent, a Prairie Schooler Owl for the Autumn exchange. 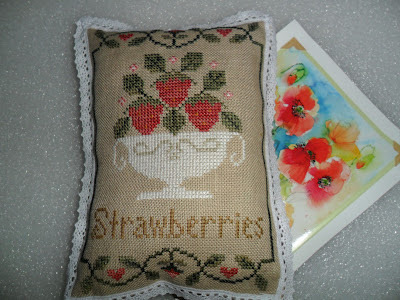 And this is what I recieved from Edgar of Blacksheep's bit of the web It is also a Prairie Schooler piece, from the Autumn Samplers chart. I love it! I hadn't seen this design before, I had seen the chart but never paid attention to this design (I have a short attention span), but I love it. The pumpkins, and the moons, and the hand-dyed linen are all my favorites. 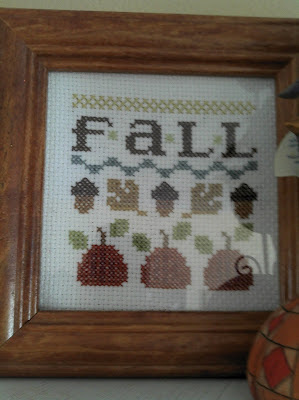 I have been so busy with the new school year I have barely had time to decorate for my favorite season! Is it odd that I differentiate between Fall/Autumn and Halloween decorating? I actually have two different boxes of stuff for each season. 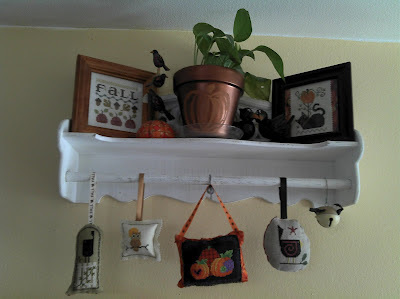 I leave out alot of the Fall decor when I put out my Halloween items, and also leave them out after I take down all the Halloween stuff for the Thanksgiving season (also a different box of decorations). 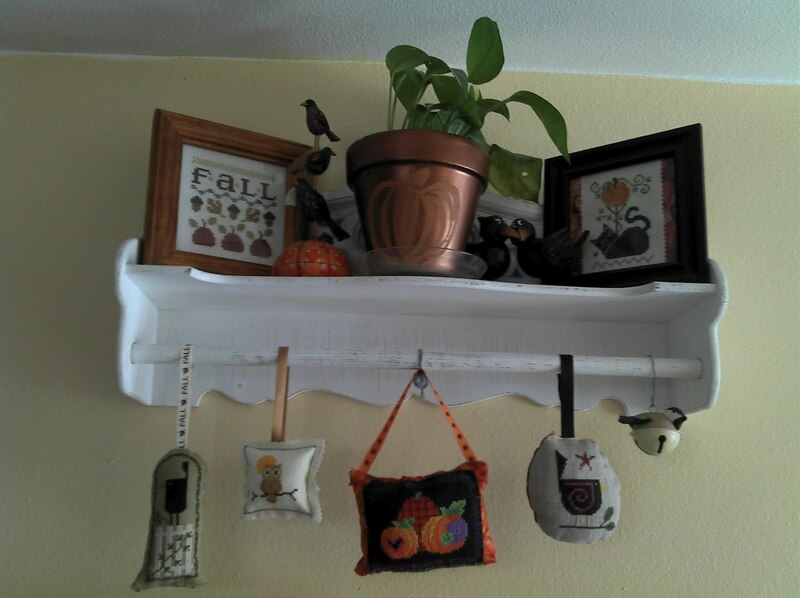 So this is the little part of my fall decorating I have started, my seasonal shelf. I need to look for a black/dark brown shelf instead of the white one I used for spring. 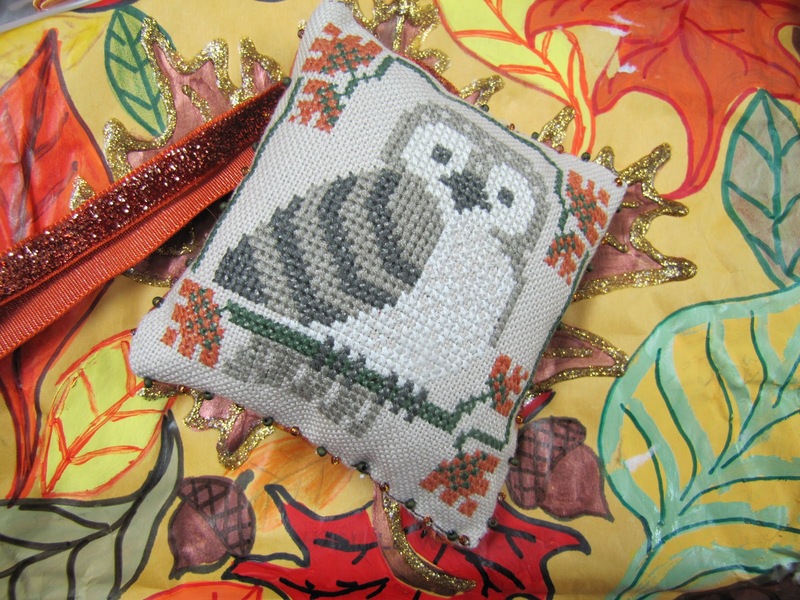 The ornaments from left to right are: "Fall Arches" Bent Creek, unknown pattern of an owl,"Pumpkins" out of Halloween Quickies by Brian Jackins, and Bent Creek "Red Wing Blackbird". 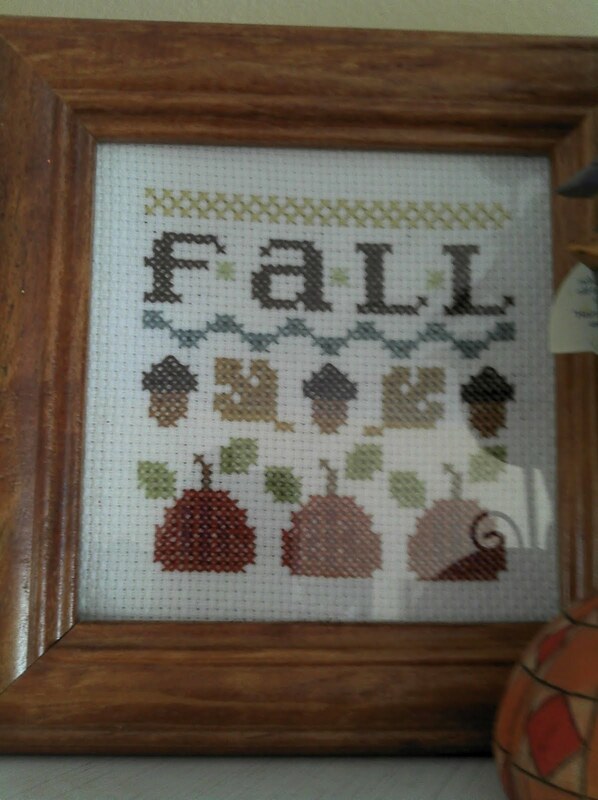 This is on the top of the shelf, Lizzie Kate "Fall squared". And this one is of course another Bent Creek. 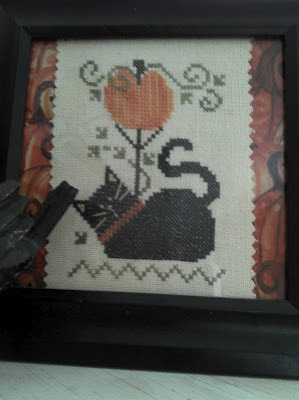 I love the pumpkin fabric I used behind it in the frame. And this was my creative project for the shelf. 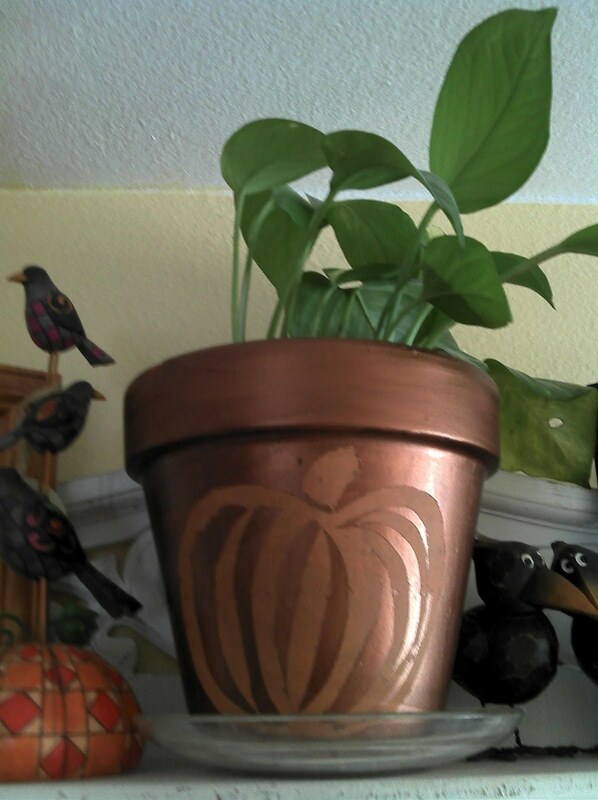 I taped off the pumpkin on a plain terracotta pot, then painted over it with a metallic craft paint in copper. And ta-da! I removed the tape for a cute pumpkin stencil. This one was not stitched by me, I bought it off ebay. 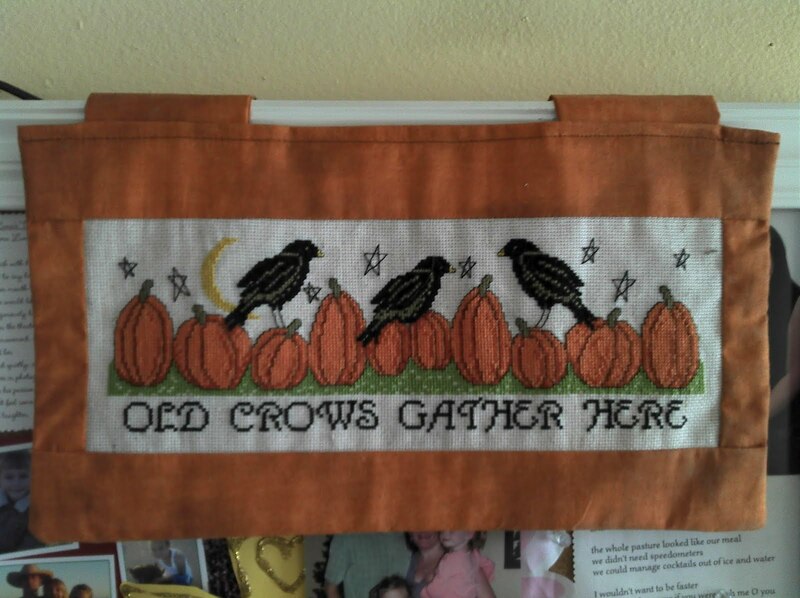 Super small stitches, and pumpkins and crows seems to be my fall theme this year. 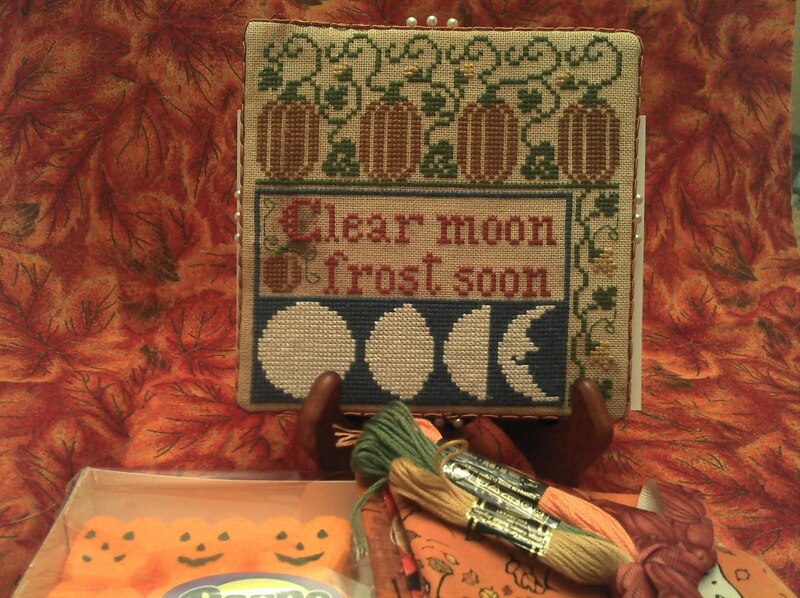 I love the long-stitched stars.